At some major banks in Vietnam, the segment has contributed more than 40 percent of total revenue, head a forum in Ho Chi Minh City on November 28 – 29. 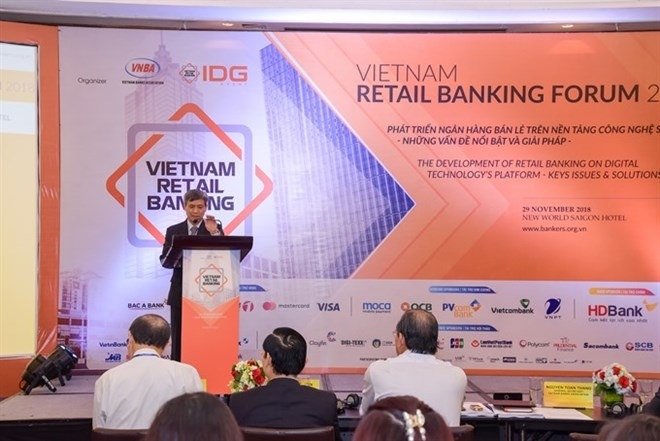 The Vietnam Retail Banking Forum 2018, themed “Optimising Retail Banking Channels in the Branch Network, Adapting to the Digital Age”, co-organised by the Vietnam Banks Association (VBA) and IDG Vietnam, brought together banking, financial experts and leading technology experts to work towards solutions to help bank branches optimise services and attract more customers with the aim of ensuring sustainable development. In recent years, Vietnamese banks have focused on the retail banking segment, a step in line with the current development trend and the State Bank of Vietnam’s policy, VBA General Secretary Nguyen Toan Thang told the forum. Furthermore, with non-cash payments trending along with the appearance of several fintech companies, Vietnamese commercial banks must focus on investing and cooperating on developing modern payment services to ensure safety and convenience for customers, he said. Ha Huy Tuan, Vice Chairman of the National Financial Supervisory Commission, said Vietnamese banks regard the retail banking segment as a vital part of their development strategies. However, he added there are still issues that need to be addressed, especially in terms of technology such as data mining and processing, product and services development, and risk analysis and management. In HCM City, the banking sector has experienced rapid growth over the past decade in terms of expertise, quantity and quality with diversified products and services. The city has the largest banking network nationwide with over 2,200 transaction points and 49 head offices, according to the National Financial Supervisory Commission. Retail banking is closely associated with consumer lending. In 2008, total outstanding loans for consumer lending accounted for only 3.8 percent of total outstanding loans, but now it accounts for roughly 19.4 percent. However, according to experts, interest rates applied by some financial companies under banks are quite high, posing many risks. The 6th annual Vietnam Outstanding Banking Awards 2018 (VOBA) was also held at the forum. The ultimate purpose of the awards is to select and recognise banks reaching significant achievements in driving business growth and contributing to the development of the banking and financial sectors.